Which College—and Which Major—Will Make You Richest? A Bachelor of Science from Harvey Mudd College, the small California science and engineering school, is the most valuable college degree in America. Stanford's computer science program pays off more than any single major in the country. For the best dollar-for-dollar investment, nothing beats the University of Virginia. As those three (all true) facts illustrate, there are many ways to answer the question What's the most valuable college education in the country? Every year PayScale, the largest private tracker of U.S. salaries, tries to answer the question. This year they released their findings in an elegant site that you can play with here. They also shared their hard data with The Atlantic, which we used to do some further calculations. Before the candy, some methodological veggies. The challenge of putting together any study like this is that it's devilishly difficult to measure the cost and benefit of college. Start with cost, which is the time and money it takes to finish school. Colleges advertise their sticker price, but about half the students at many elite colleges get grants. Without financial aid, four years at Stanford University costs $236,000, making it one of the 10 most expensive colleges in America. But the "weighted net cost," factoring in grant aid and time to graduation, of going to Stanford is more like $74,000. For my purposes, I'm interested in net cost, not sticker price. And what about benefit? PayScale has two measures that are useful. First it calculates the 20-year college premium using self-reported income surveys. This tells you the amount of money a college grad will make in two decades above and beyond what she would have made if she didn't attend college. For example, if Derek University costs $100,000 and my graduates earn $1 million extra over the next 20 years, my net return is $900,000. PayScale also measures "annualized ROI," which helps us see the dollar-for-dollar benefit of certain schools and programs. With all that methodology out of the way, we can get to the fun stuff. Here's the first big fat list: The ten schools with the highest-earning graduates over the next 20 years. By this measure, Harvey Mudd is America's one million-dollar college. Harvey Mudd's record here is impressive. 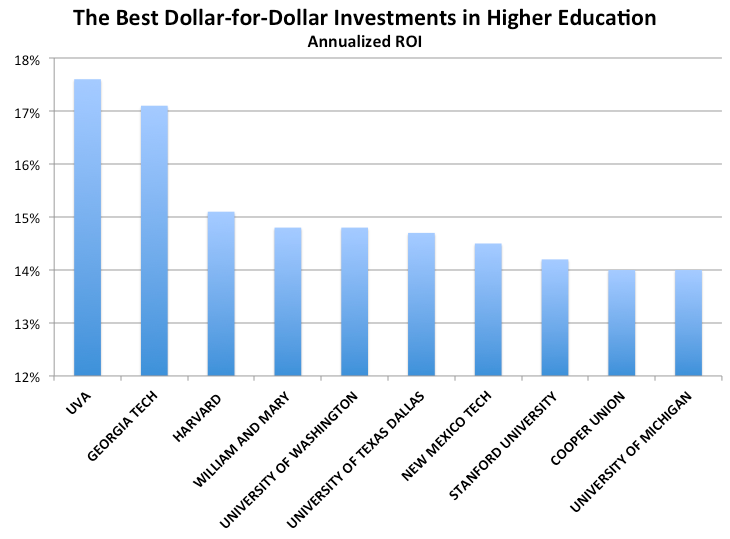 But its net cost is more than twice as much as Harvard's due to their disparity in grant aid. So it's also useful to look at annualized ROI—the "bang-for-your-buck" measure. Everybody graduates from college with a major. So I wanted to know not just which college grads get richest but which college majors are the tickets to richness? PayScale tracks that, too. 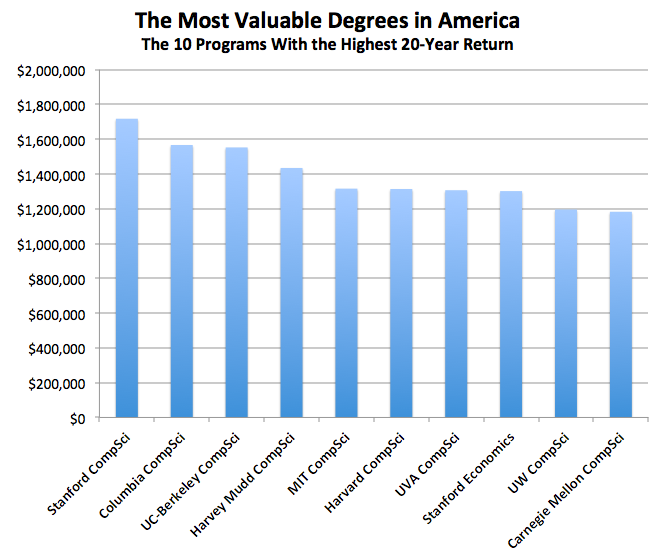 And no degree in America is more valuable than a computer-science major at Stanford, Columbia, or Berkeley. Notably, the most valuable non-computer-science major in the country is also at Stanford: economics. But once again, for dollar-for-dollar investment, nothing beats going to the University of Virginia as an in-state student. PayScale found that a degree in business, or computer science, or engineering, or economics at UVA has a higher dollar-for-dollar return than any major at any other school in the country. Yes, better than majoring in finance at Harvard, or computer science at Stanford, or business at Berkeley, or anything at Harvey Mudd. It's important to be clear about what this study is telling us and what it's not telling us. The fact that the most valuable colleges here seem so predictable is an interesting data point, because the predictably best colleges tend to get the best students. So what you're seeing here isn't just the quality of the school's education but also the quality of the students it attracts. Indeed, that's one reason why it's important to not conflate "highest ROI" with "best" or "smartest." At Columbia University, an arts major has a 20-year expected return of $477,000, but an economics major at the school earns an extra $900,000 and a computer science major gets $1.6 million. Perhaps another study can prove that Columbia's economics majors are twice as smart as its art majors. But the more reasonable explanation is that economics majors actually want to maximize their earnings after graduation. So they tailor their education to set them up for maximizing post-graduate income. The upshot of this study is that college is often a very good investment and the schools everybody has heard of do a great job of raising lifetime incomes. But majors matter, too: That's why smaller schools with high concentrations of computer science and engineering students near large cities with thriving technology scenes (Harvey Mudd, Cal Tech, Stevens, NYU Poly) dominate the list.